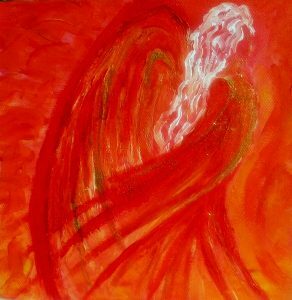 I channel paintings from the angels to capture supportive energies in my artworks that you receive and can soak up, as you are looking at the picture. If you wish to find my artworks of angel art there are two types of media I created them with: acrylics and soft pastel. 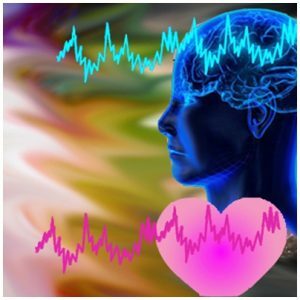 I have learn to channel energy in a psychic art course. It is a very interesting process. I set my intention to connect with the angelic realm. My canvas is empty… I centre myself… and start working with the colours I am directed to use and create brush strokes or sometimes using my fingers to spread or blend the paints and keep going until some shapes start forming on my canvas. During the process I often receive thoughts and emotions that add to the energy of the painting. You can easily raise your vibration with my paintings. You soak up the colours through your eyes and receive messages encoded in the picture at the same time, moving you emotionally, cleansing away energy that kept you stuck. Of course it becomes more effective, when you consciously apply certain positive affirmations and seek the guidance from within and from above. 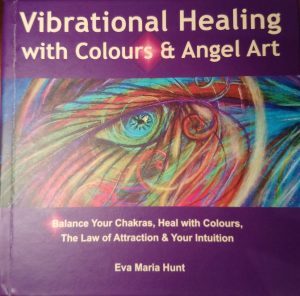 In 2016 I gathered 21 paintings in my book: Vibrational Healing with Colours & Angel Art. I provided the channelled messages for 18 of them for you to be able to work on your energy and raise your vibration. There is a DIY Miniature Card Deck section at the back of the book, with the idea of being able to carry the picture that you were drawn to, and its energy with you during the day. So you can be reminded of what you need to change or focus on to raise your vibration for better mental, physical and emotional health. How colours actually work? Colours are energy, light, the purest healing force of the Universe. They vibrate on different frequencies. The human energy field is constantly changing. We respond to our environment, absorbing its energies, and also change our own vibration, when talking to another person. Their mood, energy affects ours. Similarly the colours in our environment have a certain impact on our energy physically, mentally and emotionally. Light Orange coloured walls can make you feel warmer on a hot day, whilst Turquoise can make you feel cooler, in spite the fact the actual temperature doesn’t change around you. Certain colours, like Yellow stimulate your brain, whilst Blue makes you feel relaxed. The above mentioned Orange can lift your mood, when you are feeling down or depressed and Pink can calm you down, when you feel angry. Colours are amazing. You can harness their power to your advantage with the help of my paintings. 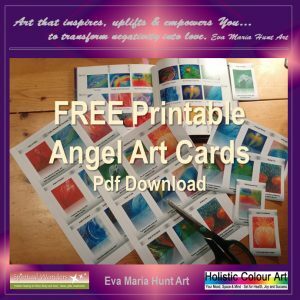 Download the Printable Angel Art Cards here. Purchase my book as a downloadable PDF here. Would you like to know more about how to work with these Angel Art Cards? On my Facebook page: Law of Attraction for Harmony and Success I draw a card periodically and share its meaning with you. Do you want to know about my latest paintings?